America’s Oldest Professional Resident Summer Theater. 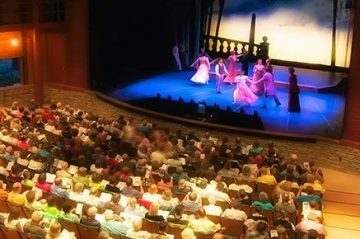 The Peninsula Players Theatre is nestled in a fragrant cedar forest overlooking the waters of Green Bay, where patrons come before curtain to stroll along the shore, enjoy a relaxing picnic, or have a cocktail while watching the sunset before the exhilaration of a live theatrical performance. The Door Community Auditorium is Door County’s 750-seat performing arts center. DCA has a rich history of bringing big name entertainment to the peninsula. The facility is used for a variety of performances from Gibraltar school concerts, musicals, and plays, to national touring acts, to the St. Norbert College Distinguished Lecture Series. The Northern Sky Amphitheatre is our little piece of heaven in Peninsula State Park. The mission of Northern Sky Theatre is to create, develop and present professional musical and dramatic productions that will further the knowledge and appreciation of the culture and heritage of the United States. Be sure to join us each season for our intimate Fall Season shows presented at the Door Community Auditorium. It is with great enthusiasm and anticipation that we announce the 2016 summer season, featuring William Shakespeare’s JULIUS CAESAR and A MIDSUMMER NIGHT’S DREAM! This season promises to be thrilling, mysterious, and full of heart and soul.